A sprain is an injury to the tissues around a joint. It involves the stretch or possibly tear of a ligament (fibrous tissue that connects two or more bones). The thumb is very important for daily activities therefore when it is sprained, it can limit the ability for an individual or sports professional to function to their best ability. The main ligament in the thumb is called the ulnar collateral ligament. If injured, the pinch and grasp ability will be weak. This injury is also known as the Skier’s Thumb as it is commonly seen in skiing injuries. The main ligament in the thumb is called the ulnar collateral ligament. If injured, the pinch and grasp ability will be weak thereby making a sprained thumb a terrible injury for professionals who participate in racket sports e.g. tennis, badminton, cricket etc. This injury is also known as the Skier’s Thumb as it is commonly seen in skiing injuries. Studies have shown that thumb sprains are the second most commonly sustained injuries whilst skiing. Injury rates have been reported to be approximately 7.1% to 9.5% of all skiing injuries. This is estimated to represent between 50,000 to 200,000 cases annually worldwide. However, it was also found that only 1 in 4 skiers with an injured thumb sought medical attention. It is also a common injury in falls and other sports such as football, hockey, wrestling, and baseball. Grade I injuries: microscopic tearing of the fibers but no loss of ligament continuity. Grade III injuries: the ligament is completely ruptured. It was also described that a complication might occur with a grade III injury where the free end of the ligament may be too far from the other end and without approximation, healing is prevented and surgery is required. The early diagnosis and management of a sprained thumb is important, as the torn ligament would weaken certain movements and impair the quality of life for patients. The objective of the examination is to differentiate between a grade I or grade II injury that will heal with conservative management while a grade III injury would require a surgical referral. Most professionals use a combination of patient history, examination of the thumb and its surrounding structures, imaging such as X-ray to form a diagnosis. X-rays can be used to rule out associated fracture (avulsion fracture) as the tearing of the ligament may have torn off a piece of bone during the injury. Computed tomography (CT) or magnetic resonance imaging (MRI) can also be used although it is a costlier technique with a long waiting line. Patients suffering from thumb sprain typically present with pain and swelling in the web space at the base of the thumb and weakness of the thumb-index pinch (difficulty with opening a door with keys, picking up objects from a surface). There may also be local swelling and occasionally bruising around the thumb joint. The general first aid measure for a thumb sprain would be rest and ice as it would provide pain relief for the patients. It is estimated that one-third of cases are associated with avulsion fractures. In these cases, if the x-ray shows that the avulsed fragment is in a good position (non-displaced) then non-operative measurements of treatment are usually successful. If the fragment is displaced by more than 5mm, the patient should be referred to an orthopaedic surgeon. 60% of thumb sprains are categorized as grade I or II injuries and can hence be managed conservatively. Conservative management includes immobilization of the injured thumb using adhesive taping until asymptomatic, using a short arm thumb brace or cast for two or three weeks depending on duration of pain and tenderness followed by a splint for 6 weeks, using a hand based thumb spica cast (a cast of layers overlapping in a V pattern used to immobilize parts of the body) which still enables the skier to continue skiing. All the following can be removed for icing and gentle range of motion exercises. Rehabilitation can begin as early as 3 weeks after injury but the thumb should still be continually assessed for recurrent instability throughout. For grade III thumb sprains, surgery is indicated as the ligament ends are no longer close enough for healing to occur. A study found that those who had surgery after a grade III injury had good to excellent results while those who were managed conservatively after a grade III injury had functional instability of the thumb. Surgery should be performed within 3 weeks to ensure optimal results. Delay in operation time can make it difficult due to the scar tissue formation that distorts the joint capsule and surrounding tissues. It is important to remind patients that rehabilitation is a must even after the surgical procedure. It may begin as early as two weeks after surgery and may take up to 8 weeks. Another general measure would be the use of analgesics (over the counter) to provide pain relief. Physiotherapists play a vital role in the prevention and protection of thumb injuries. After surgery, it is recommended that patients wear a protective orthosis (splint or brace) when engaging in activities for the first three months as this is the duration that ligament re-rupture is most likely to occur. Taping the thumb to the index finger has also been recommended as a method of thumb protection. The use of a ski glove with a strong web between the thumb and index finger has been designed to prevent a sprained thumb. Physiotherapists should be familiar with current rehabilitation techniques and can educate patients on preventive or protective measures to prevent further injury. It is also vital to be able to recognize a grade III thumb sprain injury and to refer early to a hand surgeon. During the examination of the thumb, there may be some pain and this can be avoided by applying anaesthetics (to help control the pain). If there is any doubt in diagnosis, an MRI can be a useful tool. An ultrasound may also be used but is dependent on operator skills. The recommended immobilization time is approximately 4-6 weeks followed by physical therapy. After an average of 3 months, the thumb can be fully used again. Van dommelen BV, Zvirbulis RA. Upper extremity injuries in snow skiers. American journal of Sports Medicine. 1989; 17:751-753. Derkash RS, Matyas JR, Weaver JK, Oden RR, Kirk RE, Freeman JR, Cipriano FJ. Acute surgical repair of the skier’s thumb. Clinical Orthopaedics and Related Research. 1987; 216:29-33. Carr G, Johnson RJ, Pope MH. Upper extremity injuries in skiing. American Journal of Sports Medicine. 1981; 9:378-382. McCue FC, Hakala MW, Andrews JR, Gieck JH. 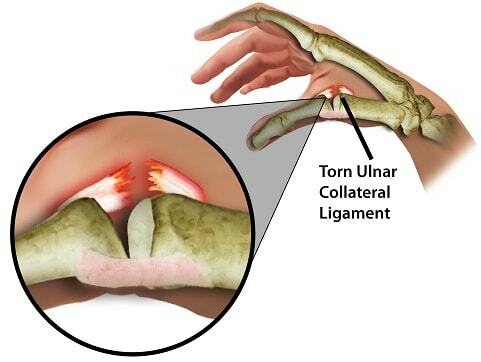 Ulnar collateral ligament injuries of the thumb in athletes. Journal of Sports Medicine. 1974; 2:70-80. Rettig AC, Wright HH. Skier’s thumb. The Physician and Sportsmedicine. 1989; 17:65-75. Stener B. Displacement of the ruptured ulnar collateral ligament of the metacarpophalangeal joint of the thumb. A clinical and anatomical study. Journal of Bone and Joint Surgery. 1962; 44B:869-879.